“Okay then, what do you want to do?” is the first thing you’ll hear in Jungle Party. No “Hi! Welcome to this boring minigame collection!”; it just gets straight down to business. So we will too. 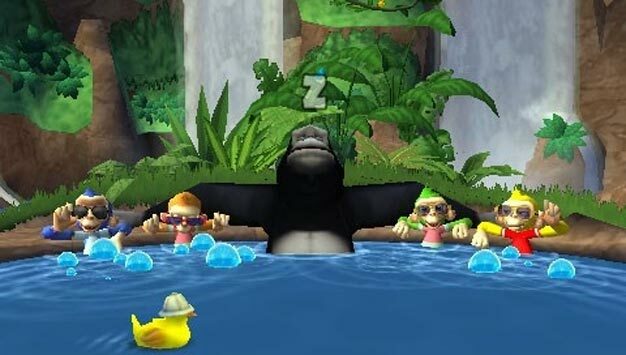 Jungle Party is a port of a very old PS2 game that used the Buzz controllers. It’s pretty much untouched, with 40 minigames that test your reflexes, patience and a good bit of luck. You can stick your head in the mouth of a lion for as long as possible, remember the sequence of colored hippo divers, play elephant baseball and a whole lot more. Without Buzz’s colored buttons you’ll have to rely on the face pad to play, which takes some of the gimmicky fun away. Aside from that it’s amusing enough for the first few tries but then the empty, luck-based games will start to grow stale. You’ve also probably guessed that this is meant to be a party game and not really something to be played by yourself. The game allows for both network and pass around play so that four friends can tackle the minigames. The problem here isn’t necessarily with the game but the system itself; four PSPs with four copies of the game is a lot to ask for. You can download a gimped version of the game on PSN right now and play it with the Buzz controllers; it may not have as much content but it’s more fun for sure to play with your friends on one TV with a controller in hand. It’s all based around a colorful jungle scene that generates a bit of fun. It’s got a solid presentation behind it that at least looks the part of a cheerful party game. Clearly it’s for kids but the PSP is already doing more impressive work for the young ‘uns with EyePet PSP and Invizimals; this lazy port of a near five year old game won’t stay on your PSP for long.